William Christopher Handy was a noted trumpet player and band leader during the late 1800s and early 1900s, but his greatest fame came as a composer of some of the earliest published blues. Handy became known as the “father of the blues”, which was not really accurate, although he did help to bring the blues style to mainstream audiences. His earliest was Memphis Blues, first performed in 1909 and published in 1912 as a piano score. More blues followed, including Handy’s famous St. Louis Blues in 1914. Despite being known for his blues, Handy also continued to publish rags such as Ole Miss Rag in 1916. Scott Joplin made a piano roll recording of Ole Miss Rag, a recording of which is included on Scott Joplin, Elite Syncopations, Classic Ragtime From Rare Piano Rolls. During this time the difference between rags and blues were not always clear. Ole Miss Rag has a section in the middle marked “a la blues”, and one edition of Memphis Blues has the subtitle “A Southern Rag”. Handy’s first exposure to the blues dates back to 1903 at a train station in Tutwiler, Mississippi. While he was waiting for a train he heard a blues guitar player for the first time. The words that the guitar player sang were “I’m goin’ where the Southern cross the Yellow Dog”. Over 10 years later Handy took that phrase and turned it into the Yellow Dog Rag. The Southern was the Southern Railway and the Yellow Dog was a nickname for the Yazoo and Mississippi Valley Railroad, two train lines that crossed each other in Mississippi. 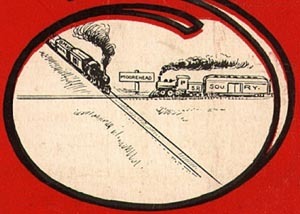 And you can even see on the cover of the sheet music there is a little inset that shows the train crossing with the names of the railways as well as the town Moorhead, where they cross. The Yellow Dog Rag used a new type of accompaniment, featuring a propulsive alternating harmony that depicts the motion of a train. The sound of this music is reminiscent of the train passage in Scott Joplin’s Crush Collision March, published 18 years earlier. But whereas that part was a short novelty in the context of Joplin’s march, in Yellow Dog Rag it became the main accompaniment. Its use in Yellow Dog Rag in turn influenced later blues and boogie woogie accompaniments. By simply rearranging the notes of the following figure from Yellow Dog Rag we get an accompaniment figure that was ubiquitous throughout 1920s piano blues. This new accompaniment figure first showed up in James P. Johnson’s 1921 piano roll of Arkansas Blues. After then it appeared in many piano rolls and recordings including Caldonia Blues by George W. Thomas, Boogie Woogie Blues by Jimmy Blythe, and Suitcase Blues by Hersal Thomas. But probably best-known today is Albert Ammons’s later recording of Suitcase Blues. 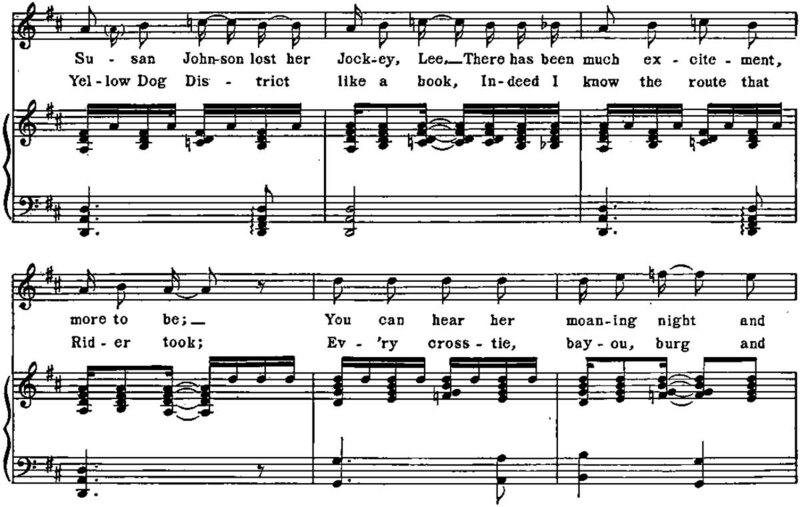 The Yellow Dog Rag, published in 1914, is another example of the crossover between ragtime and blues. 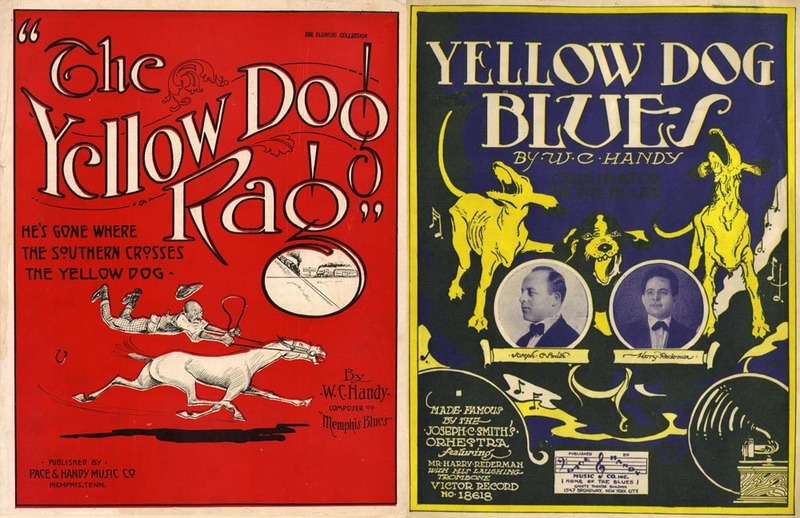 As ragtime had fallen out of favor by the end of the decade, Handy republished the same score in 1919 as The Yellow Dog Blues. Both titles are valid since Yellow Dog contains elements of each style. A collection of early recordings by W. C. Handy’s band can be found here.